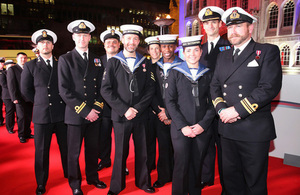 ‘The Millies’, now in its ninth year, provided the British public with a unique way to pay tribute to the men and women of the Armed Forces. A star-studded ceremony with celebrities, entertainers and politicians celebrated the courage and excellence of the Armed Forces at The Sun Military Awards last night. The hard work and dedication of UK Servicemen and women and those who support them was recognised at the special ceremony also known as the ‘Millies’, hosted by television presenter Lorraine Kelly at the historic Guildhall in London. She was joined by celebrities from the worlds of sport, entertainment and politics including presenter Carol Vorderman, England rugby player James Haskell and award judges Jeremy Clarkson and Penny Lancaster. Earlier that day, the Defence Secretary Sir Michael Fallon, Armed Forces Minister Mike Penning and Chief of the Defence Staff Air Chief Marshal Sir Stuart Peach hosted the nominees at a special reception at 10 Downing Street. There were several new awards this year including Inspiring Others – honouring individuals who have motivated others to achieve more through their awe-inspiring example – and the Innovation Award which recognised firms or individuals that have developed game-changing or life-saving pieces of equipment that transform the work of the Armed Forces. During the awards, the Prime Minster Theresa May presented the RAF with the Hero Overseas Unit award for its contribution to Operation Shader. Meanwhile, Trauma Simulation Ltd was rewarded in the Innovation category for designing and developing extremely realistic life-size models to help with medical training and care. Without this cutting edge technology, surgeons will not be able to learn and perfect the skills needed to save life on the battlefield. The judging panel made a further special award to honour the achievements of The 2nd Battalion, Duke of Lancaster’s Regiment (2 LANCS), which provided crucial manpower and support during last winter’s devastating floods in Northern England. Over the past nine years, the Millies have enabled the British public to show their appreciation for the hard work and wide-ranging contributions commitment of our Armed Forces. Our Servicemen and women are an inspiration, achieving remarkable things across the world on a daily basis, and my congratulations and gratitude extends beyond the winners to all those serving the UK with such bravery and dedication. Carol Vorderman presented an award to Sergeant Adam Threlfall who provided vital first aid to two fellow parachutists who became entangled in an uncontrolled descent. I was massively suprised to win. There was some really stiff competition in my field and across the whole Millies. It was great to be recognised and take the award back home to the team at RAF Brize Norton. It’s an absolutely amazing feeling. I am taking credit on behalf of everyone in my unit who has been rescuing migrants in the Mediterranean. It was such an uplifting evening, it really was truly truly inspirational. It’s so good for us to get a chance to say thank you, as we don’t often get a chance to do that, and to say we really do appreciate everything you [Armed Forces] do for us. The awards ceremony will be televised on Saturday 17 December and Sunday 18 December at 6pm on Forces TV (Sky 264 / Virgin 277 / Freesat 652 / forces.tv).